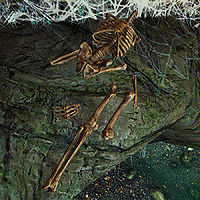 The bones of Gaston Bellefort lie in a puddle of water within the Dark Brotherhood Sanctuary, near the pet frostbite spider Lis. If you search the bones, they contain a hastily scribbled note. According to the note, he found the location of the Sanctuary and was determined to find a way inside, so it's likely that once he did, he was caught and fed to Lis. The book The Night Mother's Truth is also credited to him. This page was last modified on 17 October 2012, at 14:50.